[prMac.com] Seattle, WA - SeedCode today is proud to introduce our new calendar extension for FileMaker Pro 10. Our fastest calendar yet, this is also our most portable and is easily pasted into your own FileMaker file. Our popular calendar is now completely rewritten to take advantage of FileMaker 10. The calendar's graph and layouts are now simple enough under the hood to paste into your own file, while adding the sophisticated behaviors (like drag & drop and resizing) that users expect in a professional scheduling solution. And we've made the calendar _much_ faster when opened over a remote connection. Above all, the new calendar is easy to modify. "We knew the calendar was easy to work on," says John Sindelar of SeedCode. "But I was really impressed with the mods and enhancements our beta testers started writing, all without any prompting from us. Some of the stuff they built was truly impressive; I can't wait to see what other developers do with this." 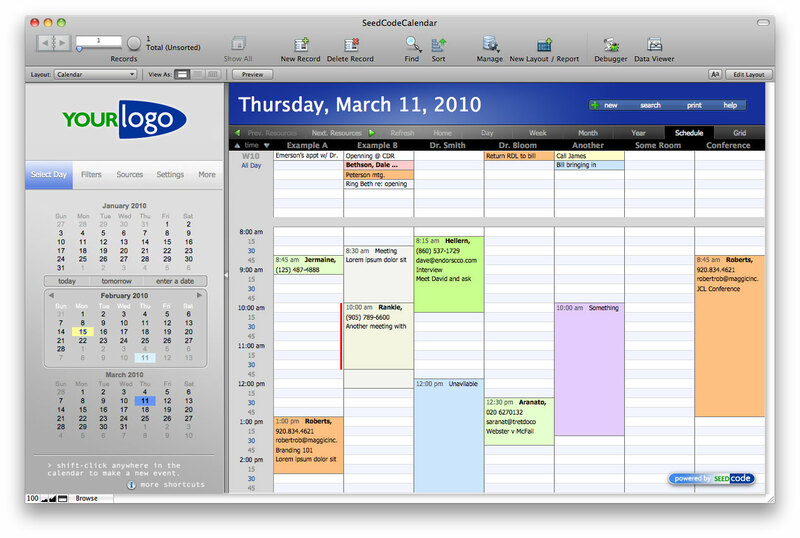 SeedCode Calendar Pro is $269 (USD) for a site license (there are no per seat charges). You can checkout short movie of the calendar in action, and download a full featured demo at our website.